I started this week off with a drink in hand – might as well finish it that way, too. Here’s hoping it will be a happy drink and not a sad drink. 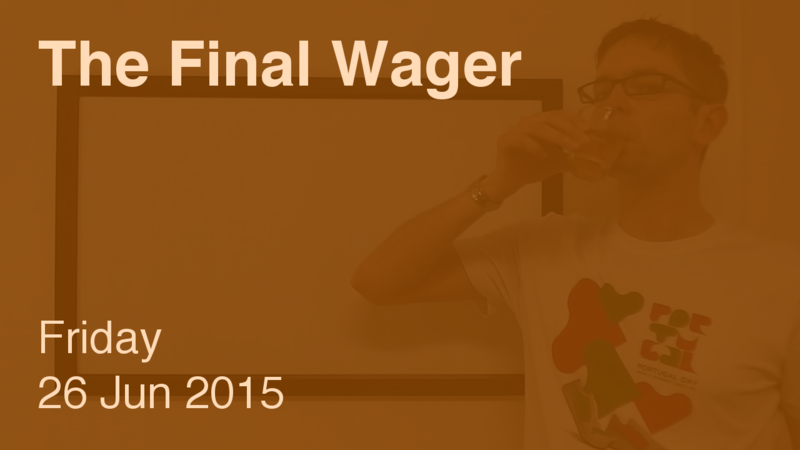 Now, were it just our champ and our leader, Matt could wager zero and hope Ankoor misses. But Kat places him in Stratton’s Dilemma – basically, forcing him to pick between covering her (and losing if he misses) or playing for a really tough clue and a big wager out of Ankoor. Yay! No forced drinking tonight… I will finish this glass of bourbon, though. Sorry to see Matt go – he was a very, very good wagerer. But he does have nearly $50,000 for his efforts. Brennan’s games aren’t on the calendar yet, just so you know.